In Part 1 I covered the overarching principles that drive salesforce – the vision that this all – meaning the current drive for the social enterprise – and the thinking that created it. I also covered the value of the environment of a Dreamforce in the consideration of the future of the things. This was the enveloping framework for the whole conference – which is a meaningful thing to look at. After all this is coverage of Dreamforce, not just a salesforce technology briefing. Today we begin to dig into the messaging and the future of salesforce, given what was announced – and not announced – at the conference. Underplayed: Several “non-social enterprise” announcements were mentioned almost just in passing such as the Data Residency Option, which given what it is (see below) was arguably one of the most important announcements at the event. Mark was playing to the crowd for the purposes of legend and dramatic impact more than accuracy in one important case. He made it sound as if his travels for the last six months to many of his key customers took him to the mountaintop where he had an epiphany that Chatter should include external customers and that we need communities! The way that it was put was “The customer social network has been a real eye opener for me.” That was just not the case. I remember a conversation at the salesforce VIP luncheon held around Oracle Open World in October 2010, where Denis Pombriant asked him explicitly when he was going to be bringing customers into Chatter and his response was “right now we are keeping it to internal collaboration and employees but we should have capabilities for external customers in about a year.” Which makes me think that his eye opener…wasn’t. However, I will say, regardless of this, if the result is ultimately community capabilities from salesforce- then let the story be told anyway that salesforce wants it to. Just accurately. What’s remarkable is that no one had been talking to any great length about a social enterprise before salesforce started to in May even though many were talking about social business, social CRM and social media to the point that just plain “social” was characterizing the initiatives around contemporary business (for more on this, see the NY Times On Language column by Ben Zimmerin 2010 on the use of the word social.). Somehow social enterprise just missed the lexicon, and salesforce.com, the best marketers of the 21st century, jumped on the term, declared a social revolution and promoted the social enterprise to Olympian status as the shape of business institutions in this social revolution. Now they own the term and can run the table with the concept. Which is not a bad thing at all. What salesforce has always exhibited a genius is not just the capture of a concept but their almost uncanny ability to tame it to their perspective. Because their perspective can drive the market, they are able to take ideas to a level of popularity that no other company in the enterprise applications world can. These popular conceptions are fed to the part of the hungry business public who are looking for innovation and looking for things to change, or are recognizing that things are changing. Salesforce.com’s declaration of the social enterprise at Dreamforce was thus an opening act, not just of a marketing campaign, but a fundamental direction that salesforce is planning to drive business. Salesforce’s idea of the social enterprise as it stands today is actually not culture change, not unique processes and best practices. 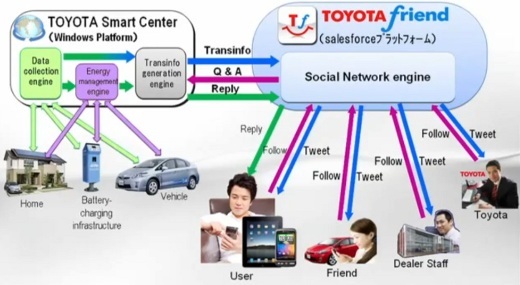 It is the enabling technology for social business. Salesforce wants to provide a holistic technology foundation that would include internal collaboration (E20) and customer engagement (social CRM). To get a feel for it, take a look at this diagram. This is the systemic view of social enterprise technology. We know that the social customer, a small percentage of the total customer base is a customer who because of their technological prowess, their communications with many others “like them”, their financial status and their willingness to proactively involve themselves in varying kinds of interactions with business, are customers who we want to know. Conversely, these social customers are leaving a lot of information about themselves on the social web via LinkedIn, Facebook, Twitter, blogs and other forms of social media and communities. Consequently, to convert them to your business’ side in the best possible way, as an advocate, if that’s your objective (it should be); the more insight you have into them, the better. Traditional CRM systems have customer records that provide you with transactional data and history. How much did the customer buy, over what time? How did the purchasing patterns change or did they? Etc. We were able to determine possible purchasing habits, determine loyalty, look at propensity to buy etc. and in the old days of a decade ago that was enough. It no longer is. We need the social data so that we have a highly personal profile of not just customer transactions with the brand, but conversations about the brand and non-financial interactions with the brand and personal likes and dislikes of the customer. The purpose is to have deep enough knowledge to gain some insight into the customer so that we can tailor a set of tools, products, services, and consumable experiences that allow the customer to sculpt a personalized set of interactions with the brand that will increase the customer’s commitment to our brand. 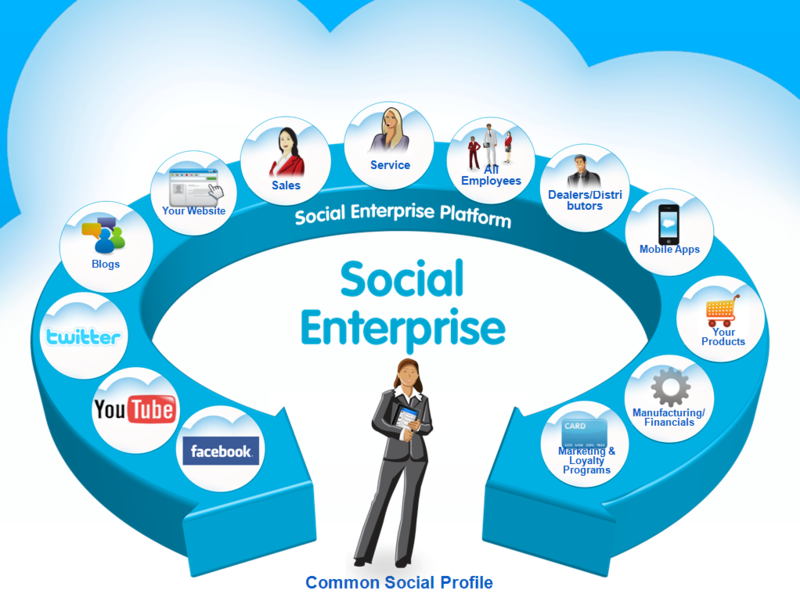 Salesforce makes this social customer profile the first of their three components of the social enterprise. The outcome is a highly configurable customer experience for the individual customer based on the insight gained via the knowledge captured in the social customer record. Ever since Andrew McAfee wrote his now famous essay on Enterprise 2.0, there have been a significant percentage of businesses that are devoting time to how easy it is to understand how high value internal collaboration supported by appropriate technologies is. Letting your employees and partners and vendors collaborate in varying ways, is a highly productive approach that brings direct and measurable productivity benefits to the companies allowing it. This isn’t rocket science. There is often institutional knowledge that has been shared by employees with each other but never memorialized in any way. It disappears back into the minds of the individual who shared it and sometimes, if they were listening, those who heard him/her share it, after lunch. What the enterprise 2.0 tools provide is a means of capturing and organizing the data in a way that provides general benefit to the entire company as soon as it is shared. That means when the employee who held it in his or her head quits, the knowledge stays. It could be business process improvement, it could be an insight into a company that you want to close a deal with; it could be a bit of competitive information (over)heard on a train. But it can be memorialized, shared, used by others, and drive a valuable conversation which is also memorialized, shared, used by others, etc. This is what salesforce wants Chatter to be. In the salesforce Chatter worldview, it starts with the employee. Knowledge is derived and actions are taken via Chatter activity streams. However, it really doesn’t stop with employees. It can be extended to what I’ve always called the enterprise value chain – the business partners and the suppliers – so that they can become participants and also be the beneficiaries of the creation of that knowledge. This is what Chatter was meant to be from its first incarnation. Was it perfect? Far from it. But, now, it is considerably better than it was then and a solid leading product for those employee-driven social networks and collaboration. Not surprisingly given that I’m a CRM guy, this is the one that I think holds the keys to the kingdom. Salesforce sees this as the incorporation of the customer or other constituents into an extended enterprise social network that will help both provide insights into those customers or more knowledge from those customers but at the same time increase the commitment of those customers to the brand because of their ability to participate in the business life of that company. I’m just a little surprised that it took salesforce this long to provide this one given that they had a limited edition of this kind of success back in 2008 with their feedback and ideation sites like MyStarbucks.com and the Obama pre-inaugural Citizens Briefing Book. While not the same as the outwardly focused Chatter Groups (see below), they certainly pointed out the promise of these kinds of things. First, while interesting, this is nothing new or revolutionary. Real time alerts from vehicles and other products have been around for years. I get pushed maintenance alerts in the car from my Acura TL – which I bought in 2003. On my iPad or my HTC Thunderbolt, I get battery low notifications for the devices themselves. When I exercise (far too infrequently, pat, pat, he embarrassedly says) I get distance power walked notifications. Second, these are nothing more than what Chatter and other products like iWay and the like have been providing for several years – the ability to subscribe to activity streams of any kind, even if they are objects like inventory management events or processes. Pretty sensors and charts about charge level do not a revolution make. Coca-Cola (ironically) has had its Freestyle soft drink dispenser for two years that not only allows the user to mix up a drink of choice using 100 different possible syrups but the drink combinations and purchases are reported back to Coca Cola’s IT HQ via wireless connections to an SAP system. That would be the precursor to this, though not the same n’est ce pas? It’s not giving the information to the individual owner but it is providing data captured in a similar manner to “the system” that is the owner of the data, just not via activity stream. I’m not saying that product social networks shouldn’t be part of the social enterprise fabric but what I am saying is that “meh” is about what I see as the “revolutionary” (i.e. disruptive) value of it. It’s a different form of an existing kind of network that will have some specific value in specific instances but it doesn’t revolutionize everything. Let’s just say, refrigerators with maintenance and spoilage notifications don’t sell that briskly. Coolness is one thing. Universal business value is another. It’s definitely cool. 1. Chatter Groups – This allows employees to build groups that can contain customers or other constituents in a private and secure environment. Marc posited this as a customer community. I see it as a positive step toward them but they are nowhere near the level of say, a Lithium or Jive customer community. They are closer to a private user group or threaded discussion. But you have to start somewhere so it’s a very decent first step – and free. 2. Chatter Connect API – This REST API is one of the most important pieces of technology that was announced at the conference. What it provides is the capability to integrate Chatter with almost anything – including other social networks, Sharepoint or other document management systems, or pretty much anything you could think of them integrating with. 3. Chatter Now – This is both an instant messaging (”chat”) tool and a screensharing collaboration tool. Nothing dramatically new, just smart. The IM piece will be end of this year and the screensharing in 2012 with a price attached. The sooner the better. 4. Chatter Approvals – This is exactly what it sounds like. You can approve things from within Chatter. You send a message to someone with hiring authority that says, “so, can we hire her?” The approval will be sent via Chatter and the new hire can become part of the stream as soon as the approval is registered. Free. 5. 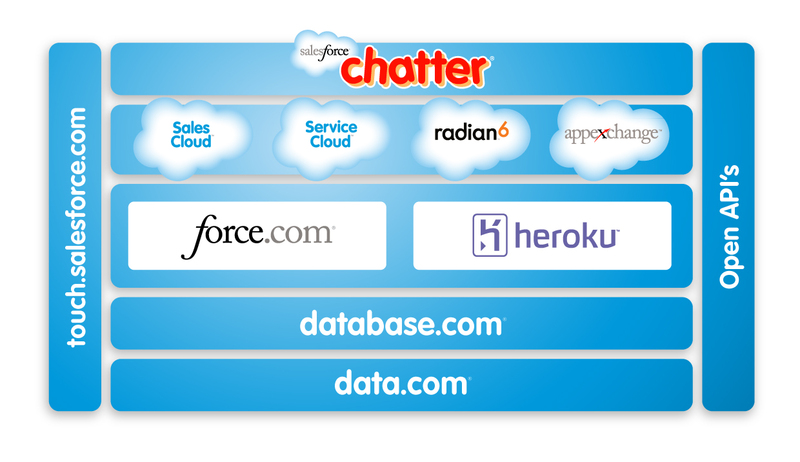 Chatter Service – Chatter will be integrated into Service Cloud in 2012 (more on that later) for a price. Once again, smart. Okay, I’m tired. Let’s call it a day. Tomorrow #3 will be here.